I've been getting back into the swing of painting lately with a variety of projects, but this one was mostly for fun. 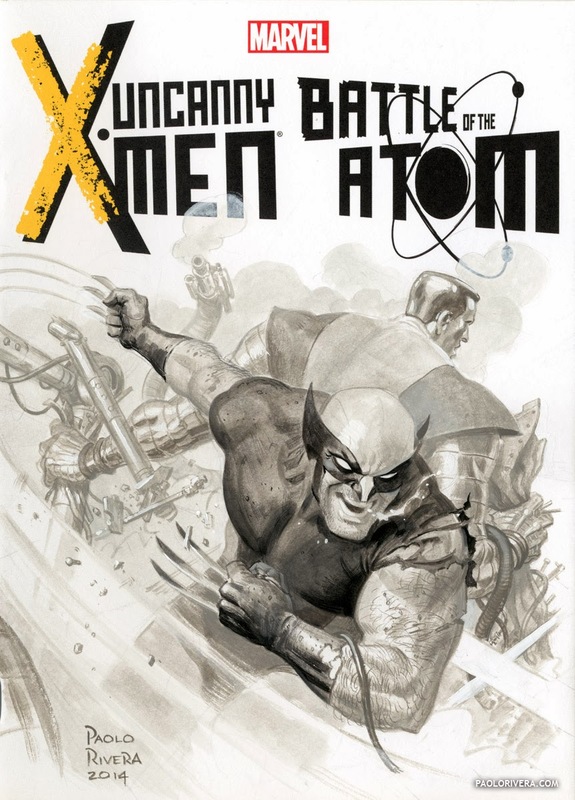 It was painted directly on the sketch cover of a comic book which, if you're not familiar with the industry, is just one of many kinds of variant covers used to entice collectors. 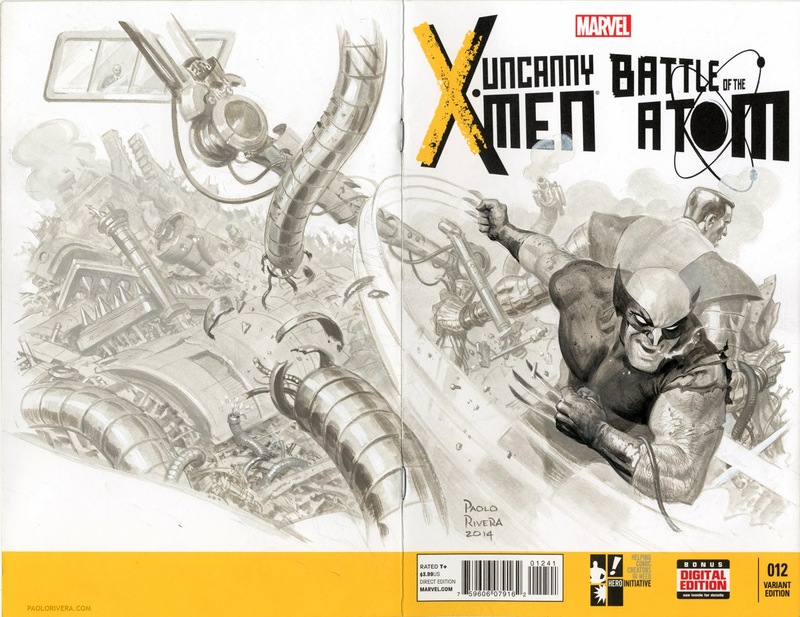 The "sketch cover" is special, however, because it gives fans the opportunity to get original art from their favorite artists at conventions. I happened to do this one at home since it will be auctioned off for charity (benefitting the Hero Initiative). I stuck with black and white because I had already missed the deadline (and most of the other entries are usually monochromatic). If my iCal is to be believed, it took exactly 8 hours to finish using Holbein gouache (black plus 3 grays) with accents of white Acryla Gouache. Gouache and acrylic on bristol board, 14 × 10.5″. The painting process was pretty loose, especially because the bulk of it is a mess of debris (a favorite subject because of its relative ease). I worked transparently for the most part, only applying paint thickly once I was assured of the form. 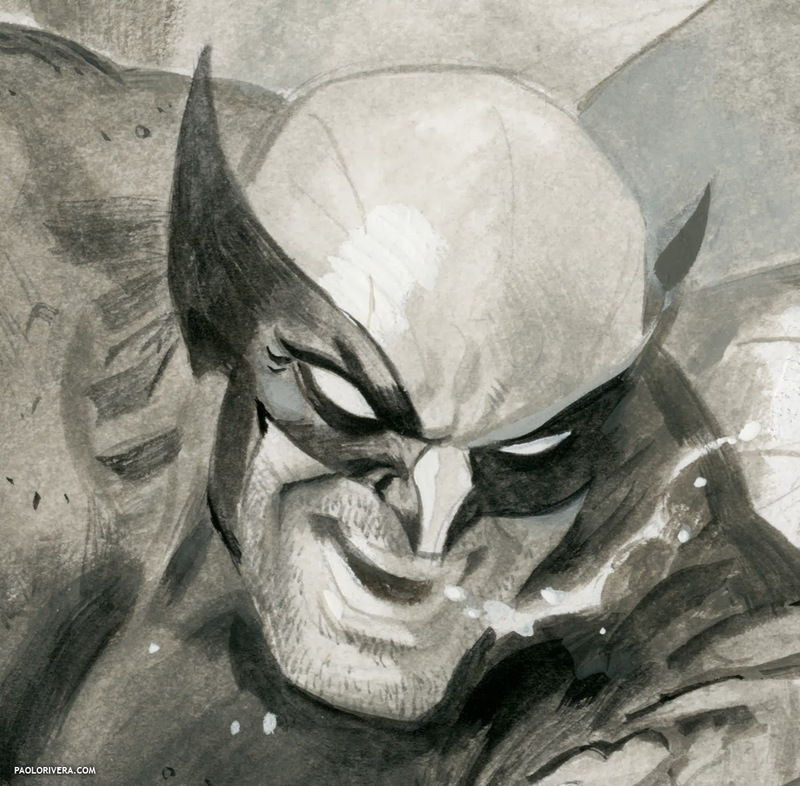 You may notice the slightly cooler right shoulder of Colossus — this is where I worked more opaquely in order to cover up previous failed attempts at Wolverine's mask. Although I didn't do it here, adding a touch of orange can counteract the bluish, chalky effect of opaque white. Do as I say, not as I do. As for the subject matter, you may be familiar with the two-man wrecking crew. They're tearing apart the infamous Danger Room while Professor X watches from the safety of the control center. 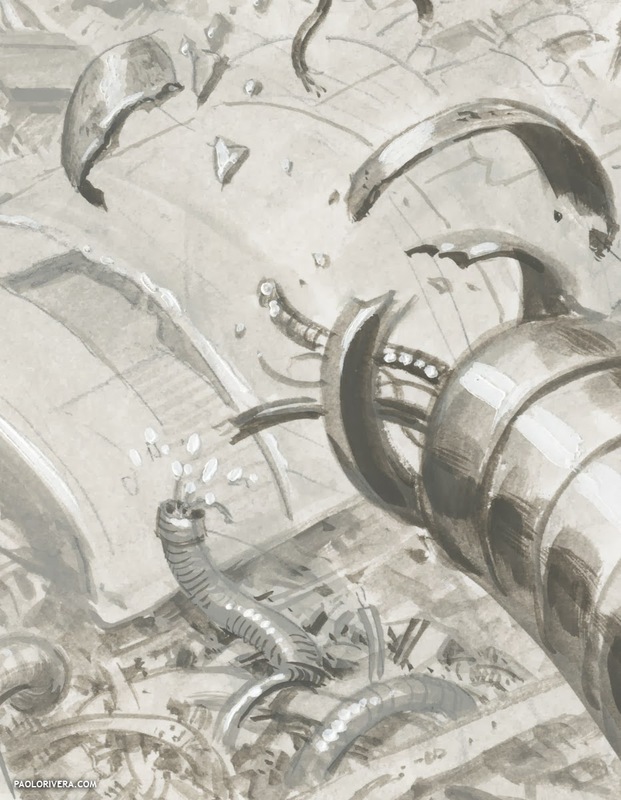 (I'm not exactly sure how Xavier can afford to have such expensive equipment turned to scrap on a regular basis, but I would imagine it has something to do with his ability to read and control minds). MYTHOS: X-MEN page 6. 2005. This isn't the first time I've rendered the duo, nor is it a first for the setting. 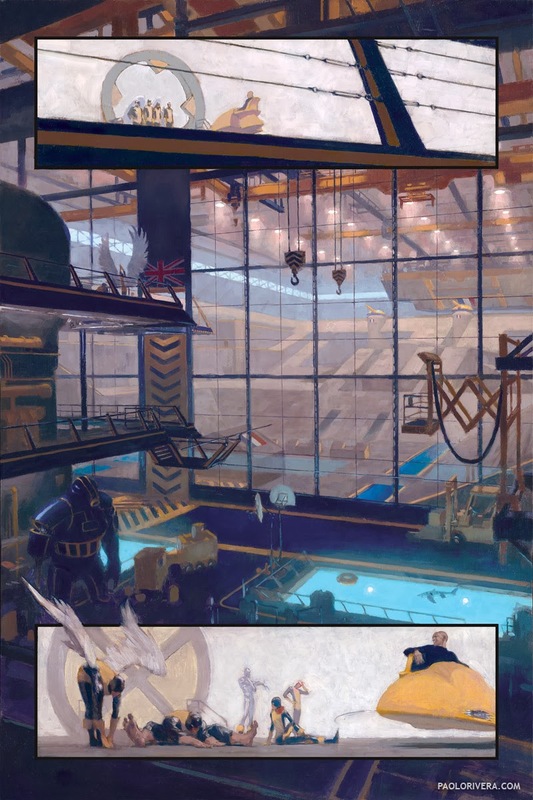 I first painted the Danger Room in 2005 as part of Mythos: X-Men, a project I detailed in a previous post. That take was not the typical representation, as the writer, Paul Jenkins, had requested a more grounded, realistic version. The result was a cross between the school gymnasium and American Gladiators. 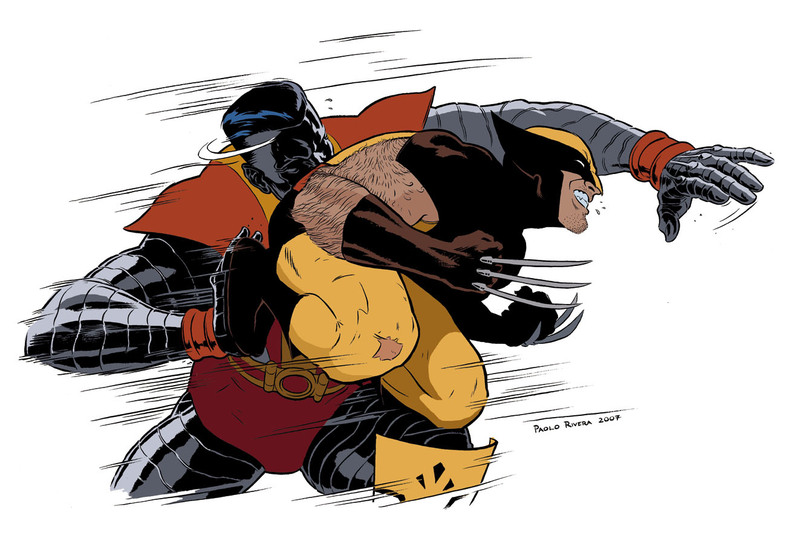 And finally, the "Fastball Special," a particularly popular maneuver, is what helped me transition from painting to line work back in 2008. I completed this piece for a book of commissions my art rep was putting together. When my editor saw it, he asked if I'd be willing to apply that style to my Marvel work. That's pretty much all I've been doing since, but I still like to break out the paints every once in a while.